Mathew: Okay. This was really fun and it was good to see video games getting their due, and it was cleverly written and it had something for people of all ages, so I don't want to hear any arguments where you start saying I'm a little girl or I like movies for babies or you're mad about the inside jokes or you think the animated characters are demons that you have to fight. This was an enjoyable story on an adult level, the animation was good and any reasonable person would probably agree with me. Helm: You will hear no argument from me. Mathew: Darn straight I'll hear no argu-- Wait. What? Helm: You will hear no argument from me. I am willing to stipulate to your points about the film. Helm: Great. Are we done here? Mathew: What are you up to? Helm: I am not "up to" anything. Mathew: Why aren't you disagreeing with me, or at least taking the opportunity to mock me? 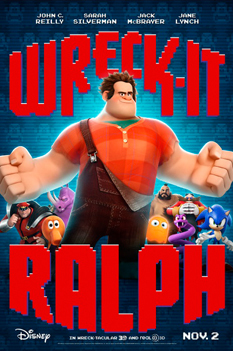 Helm: I see that even you find it next to impossible to believe that you could possibly be right, but in this instance, I am willing to accept your assessment of Wreck-It Ralph without argument. Mathew: Damn it, Helm! What's going on? Helm: Nothing. How many flaming swords do you want to give the film? Four? Yes? Four it is then. Mathew: So, we're just done? Mathew: No way. This was too easy. Helm: Every review need not be a battle. Mathew: So you totally agree with everything I thought about the film? You feel the same way? Helm: I am willing to stipulate to your points. Mathew: What's up with the lawyer talk? Helm: I am not talking like a lawyer. I am merely reiterating that I am not arguing with your assessment. Mathew: Which is different than agreeing with it. Mathew: Which is different than agreeing with what I said! What the hell, Helm? What did YOU think of this movie? Tell me! Helm: Why must you always be such an insufferable busy body? Why did the gods curse me with you?! Why do you always dig in your heels at exactly the wrong moment?! Why?! WHY?!! Helm: Fine, you pernicious pettifogger! I do not have an opinion because I did not see the movie. Helm: Yes! Whilst you giggled and cheered for your childish and infantile cartoon, your face glistening with popcorn butter, I projected my awareness into the next theater over and watched a delightful and challenging film called Seven Psychopaths. Helm: Dude me not! After you dragged me to Hotel Transylvania, I swore I would not knowingly watch another cartoon with you on the big screen this year. You drove me to this deception. Mathew: I can't believe you walked out and didn't even tell me. Helm: I cannot believe you did not even notice my absence. Mathew: Since when are animated films such a burden? Helm: Since the last one was not only animated, but an Adam Sandler film.